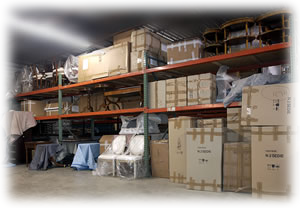 Our secure and heated warehouse provides the short term storage required to coordinate deliveries to or from your home or business, allowing you to operate on the schedule that best suits your needs. Don't be tied to your home or office waiting for multiple deliveries. Let us receive your shipments and make one convenient delivery to your home or business. Are you a business owner? We provide supply chain management for incoming resources, and product distribution for your finished product. AGS will stage your merchandise when you're ready to move it, and then make one convenient delivery on your behalf. You recover valuable floor space in a timely fashion, and your customers enjoy the courtesy of a single professional delivery. Have you've purchased furniture online or locally? Do you really want to deal with multiple deliveries, never seeing the same agent twice? Worse yet, do you want a parcel agent to leave your items sitting on your front porch. Or would you prefer one delivery, at a time of your choosing, from a capable and cooperative team? Are you running a business that requires you to be away from the office? Don't waste time making arrangements with neighbors, finding posted notes, and tracking down your packages. Allow us to receive them and make one delivery at whatever interval works for your business. Let us show you how to leverage LTL Freight (less than truckload) to get timely deliveries of the supplies and merchandise you need while keeping your shipping expenses under control.